I’m a huge fan of fruit salad when it’s made well. The stuff from a can? Yuck. But a homemade version full of fresh, ripe fruit and brightened up with a homemade lime-mint simple syrup? Heavenly! Last year, after Fearless Baby was born, a bunch of friends generously brought us meals and snacks. Our friend Beth brought a lime-mint fruit salad and it was so wonderfully delicious that I asked her for her recipe straightaway – it’s now my go-to fruit salad for parties, potlucks, and picnics. The fresh, juicy fruit is complemented perfectly by the slightly tart, bright, citrusy lime-mint dressing. This salad is particularly fab because you can customize it depending on your favorite fruits and what is in season locally. I choose pineapple because it’s my husband’s favorite fruit, and strawberries and blueberries because they’re starting to appear locally at the farmers markets, and that combination turned out beautifully. Peaches will be in season here soon, and they would be a fabulous addition to this salad. As long as you keep the ratio of fruit to the lime-mint syrup the same, you can experiment endlessly with different flavor and texture combinations. So give this awesome fruit salad a try, and do report back what fantastic combinations you come up with! Wash, peel, and chop fruit as desired. Place into large bowl. In a blender, combine the simple syrup, lime juice, and chopped mint. Toss the syrup over fruit and stir until well-combined. Chill and serve. my favorite fruit combination, too! though I agree peaches + berries would probably be delicious, too. my kiwi-berry combo for breakfast at my desk this morning is suddenly looking sad thanks to the lack of simple syrup + lime + mint. womp, womp. I love this! 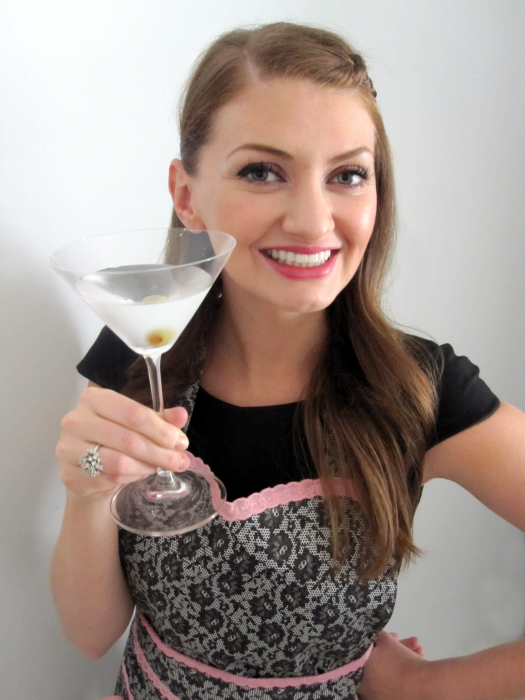 I make a similar version with honey and I need to add the mint! It works so well with just about any fruit. I can eat my weight in it. Gorgeous pic! Ooh, I’ll have to try this with honey instead of simple syrup one time. Good idea! Fresh, homemade fruit salad is the best! Your version looks wonderful. So pretty. I’m thinking you could freeze left overs and make margaritas! That is a brilliant idea, Angela! This looks amazing. I love a big bowl of fruit, especially this time of year. I’m planning my daughter’s 5th birthday party for next month and wanted a fruit bowl, so I’m totally making this! Thanks! Fantastic, Shannon! =D My daughter’s 1st birthday (!!!) party is next month, too, and I’m also planning on making a big bowl of this! I wouldn’t mind digging into this fruit bowl right about now! I just had airplane fruit salad recently and I literally could not eat it. I wish they had this instead…love the fresh herbs/fruit combo! i make a similar mint lime dressing, but with honey too…and it’s fab! last time i made it i used cantaloupe, strawberries, oranges, and kiwi as the fruit…it was a great combo i’m so excited it’s berry season!!! 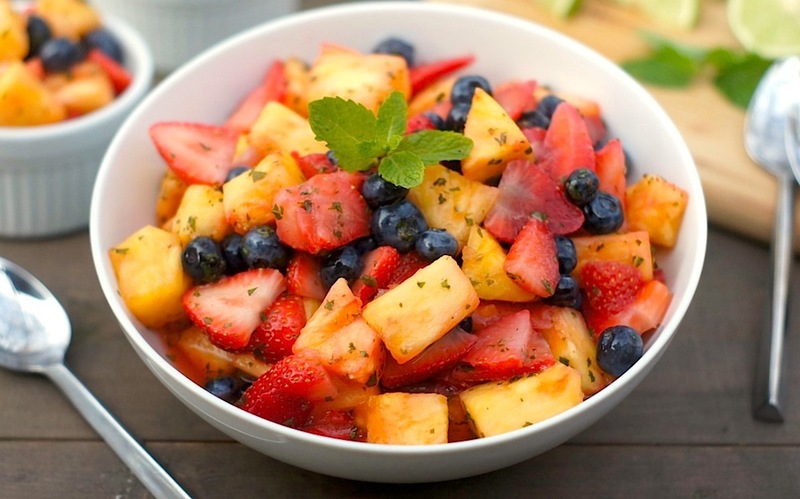 Love fresh fruit salad! That lime mint dressing sounds perfect! fruit + mint is always a winning combo! i need to remember this rule outside of mojitos.. I love a fruit salad. And lime makes the best base for a dressing! This sounds wonderful – lime is definitely underappreciated. It’s flavor is great with fruit. I love being able to open the fridge and grab bowl of fruit as a snack – it beats crackers and cheese any day! 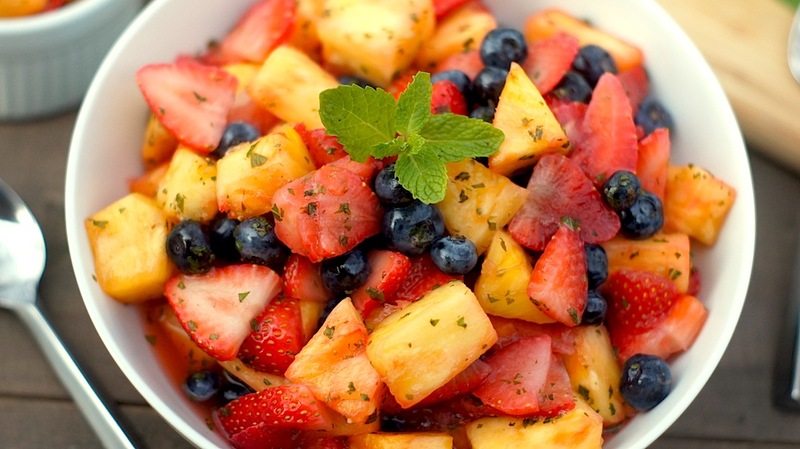 Fruit salad – what a brilliant friend to bring something so fresh post-baby! I need to remember that. I love homemade fruit salad. Yes! While i loved the casseroles and dinners and baked goods, I reeeeeally loved having something fresh and healthy around! I agree…fruit salad in a can is gross. We eat a lot of fruits in our house, but I don’t usually put them together in a salad because the kids eat them so fast. I’ll have to give this a try. Would love if you shared this on the Merry Monday Linky Party. It goes live today at 9PM PST and runs until Thursday. What a beautiful dish – thanks for the idea – I am always looking for ways to use the fresh mint from the garden. You’re killin’ me with this gorgeous salad, Amy! I cannot. get. enough. fruit. And with that lime-mint dressing? Irresistible. I’d shovel this in by the pound! I have never thought about dressing my fruit salads. What a brilliant way to make the bounty of summer even better!